After introducing Fluence in the Indian market, French auto major Renault is all set to launch it's stunning SUV -- the all new Koleos in India. With its very sporty exteriors, Koleos will take on Ford Endeavour, Chevrolet Captiva, Honda CR-V and Mitsubishi Outlander among other SUVs in India. The model which is to be launched in India is actually a facelifted version of the Renault Koleos that is being offered worldwide since 2008. The front of new Koleos has been revised to reassert its forceful character. Slimmer headlights and modern ORVM (Outside Rear View Mirror) now incorporates LED indicators. Sensing that diesel is in vogue in the country due to the rise in petrol prices, Renault has chosen diesel to be the base variant for Indian roads. 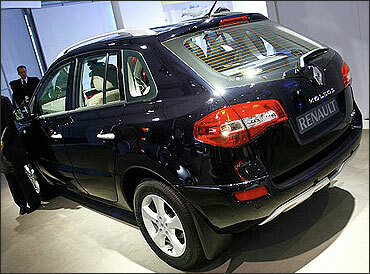 Image: Side rear view of Koleos. Powered by a 2.0 litre dCi, 1995cc, Euro-IV, common rail diesel base engine that churns out a top power of 150 hp and another 2.0 litre, 173 bhp high-end engine, Koleos can attain a highest speed of 185 kmph and 200 kmph respectively. The powerful turbo diesel engine is expected to be coupled with a 6 speed manual transmission that results in greater acceleration on all four wheels i.e. 10.4 seconds (in base engine), 9.8 seconds (in high-end engine). Image: Head lamps of Koleos. This 4X4 crossover will have the comfort of a sedan, and cabin space of an MPV. 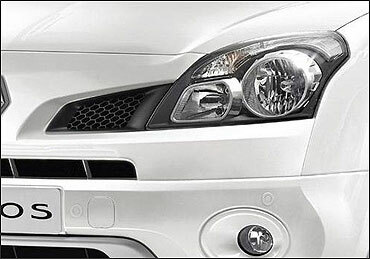 Developed in alliance with Nissan, Koleos has prioritised its tough looks by providing front, mid, and lower grille with the car with the third one surrounded by skid plates. The car also has body colour rear view mirrors and door handles. The most distinctive exterior is the split opening tail gate that allows loading of over one meter wide objects in the trunk making the SUV ready for long excursions. Large taillights, rear spoiler with high stop lamp, compact antenna, rear wiper on wider wind shield, wide wheelarchs, roof rails and three reflectors at the bumper also comprise some distinct exteriors. 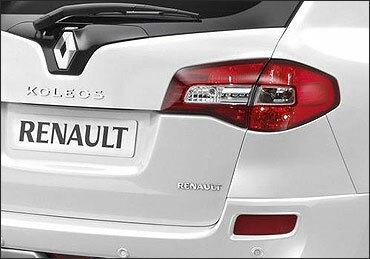 The overall length of the upcoming Renault Koleos would be more than 4.5 metre. 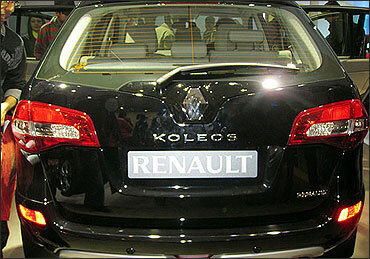 Image: Tail lamps of Koleos. The leather upholstery clad interiors give a sense of well thought seating arrangement inside the spacious cabin. Apart from the large glovebox, underfloor compartments and folding tray tables, the rear seat in this 5-passenger SUV can be folded flat that increases cargo capacity up to 1,340 litres. 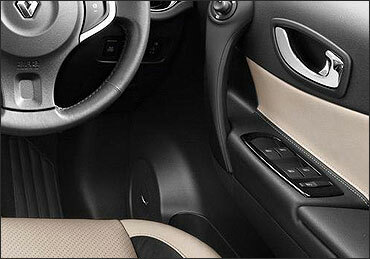 Image: Renault Koleos' driver's side inside door control. The tilt and reach steering wheel comes with 3 spokes and chrome inserts. 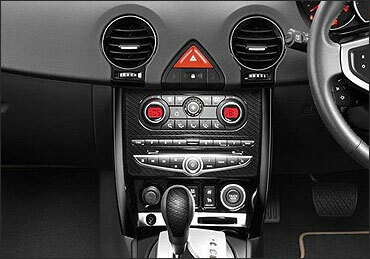 The four AC vents face the occupants and ensure better air flow. Image: Rear view of Koleos. 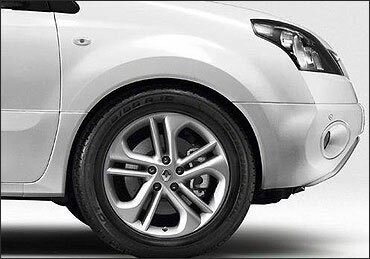 A proven safest car, Koleos has done no bartering with consumers' safety by loading it with Anti-lock Braking system with Electronic Brakeforce Distribution system (EBD) with Brake Assist, airbags, front fog lamps, all disc brakes, parking sensors, etc. The car has received a 5-star score in the EuroNCAP tests. 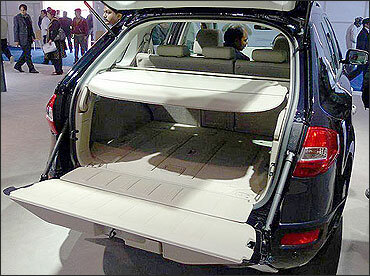 Image: Luggage space of Koleos. 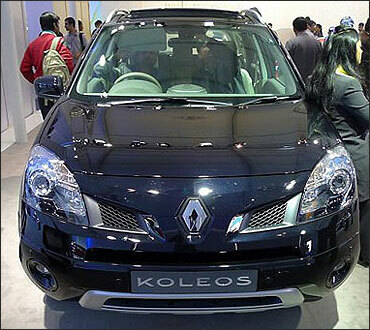 Renault Koleos is expected to be tagged at Rs 20,00,000 (ex-showroom price in Delhi) which will place it below SUVs like Honda CR-V and Mitsubishi Outlander and above Ford Endeavour and Chevrolet Captiva. 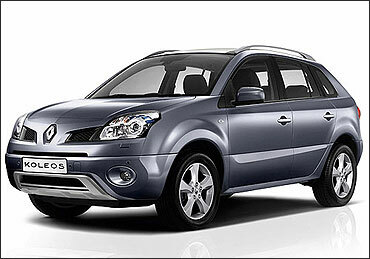 Although Renault is keeping high hopes with Koleos, the brand value of Ford and Honda will not release its neck easily. 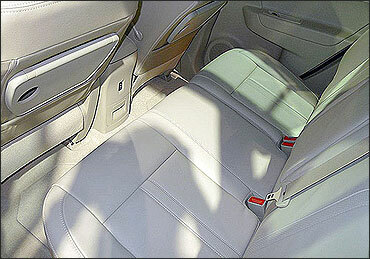 Image: Rear seats of Renault Koleos. The increasing number of Chevrolet service outlets will also give Koleos' sale a rigid competition. 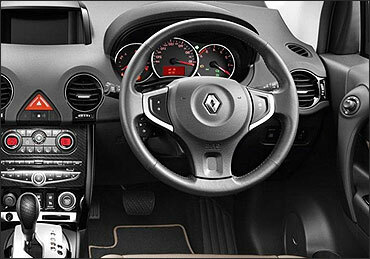 Apart from this the AC controls and audio controls are placed very low at the centre dash that might trouble the driver when operating Koleos unlike other competitors. The rear seat row is also not comfortable in terms of legroom. Only high maintenance cost of SUVs is an area where its rivals are failing and this can be a key strategy for increasing sales. Image: Side view of the Koleos.